These Mattress Toppers are wonderful! All are individually made. The wool is from our own sheep or from local small farms. I hand wash the fleece in a citrus chemical free wash/scourer. The fleece is then sent off to the mill where is made into batts without the use of oils on the rollers or any anti static sprays/chemicals. 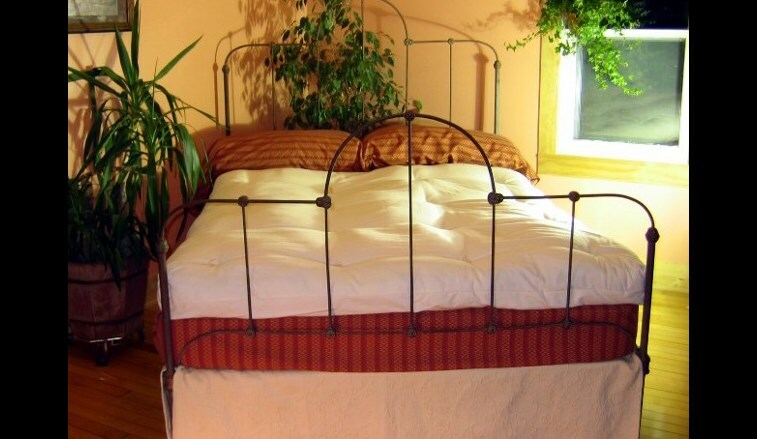 When it arrives back here at Kinkoona Farm, a cover is made from a delightful 230 thread count organic cotton sateen. It is quilted through with an organic cotton yarn. This stage is completed by my skilled and kind Amish neighbor. The result is a 4-5” thick cloud of wool covered in a smooth and very soft cotton cover that we are very proud of! Care of your woolen Mattress Topper: Simply shake, as with a comforter to increase the loft when needed, and if after years you want to recard the wool, just remove the cover and the mill will recard it for you without having to turn around and buy a completely new topper. Note: Due to the chemical free nature of these toppers, the mattress toppers are not sprayed with flame-retardants. So simply lie in comfort, with no chemical smells, snuggle down warm in winter, and cool in summer! You’ll wish you had done it sooner! !